I’m a little bit sad today. 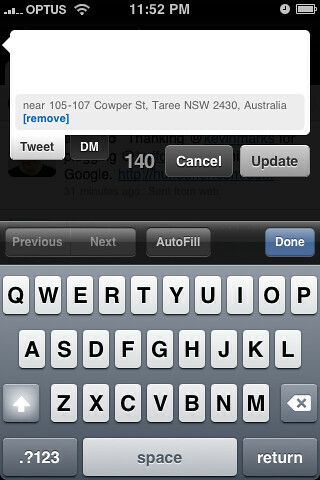 Twitter has today turned off v1.0 of their API. 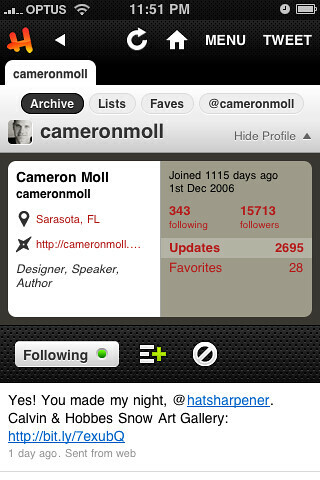 As a result of this my mobile twitter client, Hahlo, has also ceased to work just short of its 6th anniversary. Six years is a long time in the web world, I know a lot of things now that I wish I’d known back then – sure would have made many things a lot easier. When they originally announced the plans for the v1.0 API retirement I investigated ‘upgrading’ Hahlo to use v1.1 of the API, but the changeover would have required much more than a simple find ‘1.0′ replace with ‘1.1′. An extensive reworking of the code was something I just simply didn’t have time for – especially considering that it had been a couple of years since I’d looked at the code, and it was neither very well organised nor suitably documented. Rookie error. So, the code didn’t get updated, and Hahlo was destined to die when Twitter eventually pulled the plug on the old API, which has now happened. Hahlo has been around longer than the iPhone, or any other iOS device, has even been on sale in Australia – and many other parts of the world. In fact the first two iterations of Hahlo were developed entirely without first-hand access to an iOS device. Big thanks to all those on the other side of the planet who helped test fiddly incremental changes as I made them and posted about them on twitter … using Hahlo, of course. 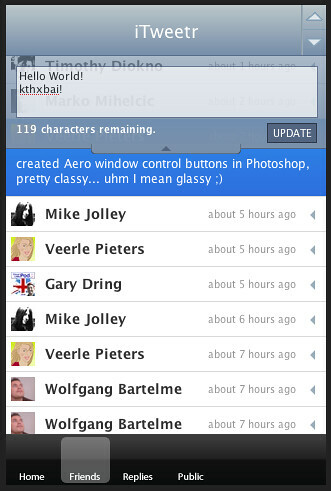 Hahlo comes from a time before native apps were even an option. It was one of the original web apps designed specifically for – but not limited to – iOS. Development of the original concept was started on the day of the WWDC keynote in 2007 – in fact it is exactly 6 years to the day (depending on which part of the world you are in) that I posted the original concept. A more ‘functional’ version that people could use followed a couple of weeks later. 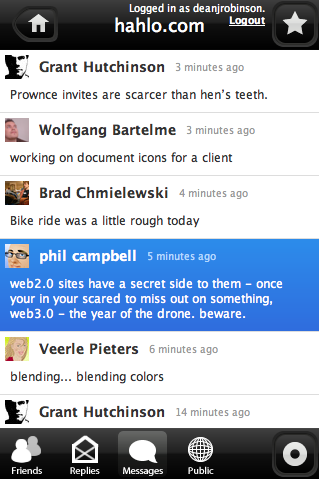 My concept also landed me on the front-page of Digg which was more of a ‘big’ thing back then than it is now. Of course, webapps are still around now, but they are much less dominant than they were 5 years ago – despite what some corners of the web will still try and tell you. Mind you it’s hard to imagine such a time existed now that Apple have sold more than 50,000,000,000 native apps – god only knows how many of them are twitter clients of some variety (and of quite varying quality). 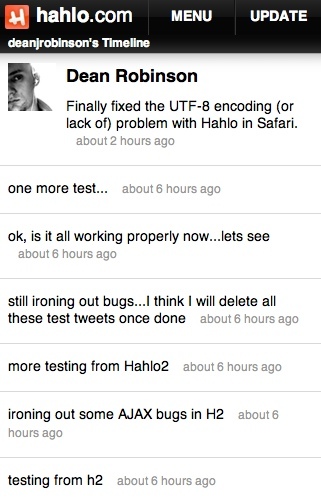 Hahlo is/was just 2 weeks short of its true 6th anniversary – and even though it hasn’t had any regular maintenance since 2009 it was still 90% functional (a few things had broken, and never been fixed, as the Twitter API evolved over time, most of them were minor). 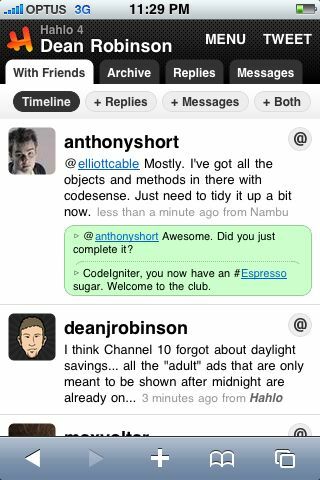 It might have been conceived as an iOS-dedicated web app, but it was much more. It was truly cross-browser (user experience did vary…) with people using it in everything from Safari to Firefox to Chrome to Opera and even Internet Explorer – although I doubt the experience was very nice in IE. Of course, as you’d expect iOS users made up the bulk of visits (about 60%), outside of that – somewhat surprisingly – there were equal amounts of Windows and Mac users (about 15% each). With the remaining 10% logging on using a variety of gadgets including: Playstation (PS3 and PSP), Blackberry, Nintendo Wii, Nokia phones, Android devices, Linux, Windows phones and probably any other device from the last 5 years that you can think of. Hahlo has had visitors from 198 countries/territories (according to Google Analytics) – The top 10 countries (in order) were United States, United Kingdom, China, Japan, Germany, Canada, Australia, Netherlands, Brazil and France. Within those 198 countries Hahlo had visitors from some 16,392 cities/towns – Top 10 being (in order) London, New York, San Francisco, Seattle, Tokyo, Chicago, Beijing, Sydney, Los Angeles and Atlanta. @hahlo was twitter user 7,097,682 – now, 6 years later there are well over half a billion active users on twitter… not to mention all the wonderful spam bots. Hahlo was just the 28th ‘app’ registered for the Oauth API – the time when registration of apps with Twitter became required – there are now more than 4.5 million apps registered. 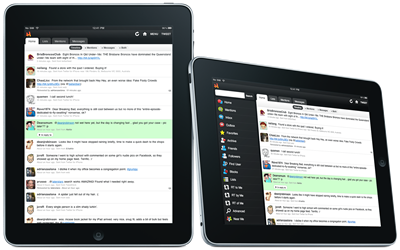 There were 4 major version releases – with a few smaller updates in-between – the last being v4.2 in May 2010 when I added the iPad layout. The original version was really just a timeline and a profile, by the time it reached versions 3 and 4 I think I had pretty much every Twitter API endpoint covered. While traffic to Hahlo is just a faint shadow of what it once was – now just 4,500 visits a month down from around 300,000 per month at its peak (May 2008) – there have still been nearly 1000 active users in the last 6 months. I’m sad they now need to find something else, but I’m sure they’ll be ok, there are countless options available to them. I’ve know this day was coming for a while, and although it’s a little sad, I’m not worried – nor should anyone else be – there are a ton of great alternatives out there. 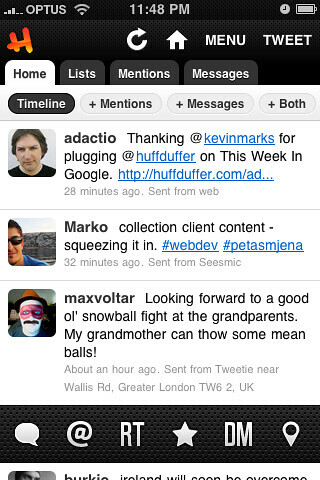 Twitter.com is a whole stack better than it once was, and there are great mobile clients literally everywhere you look, my personal preference (on iPhone, iPad and Mac) is Tweetbot but both Twitterrific and the Official Twitter clients are also pretty great options. 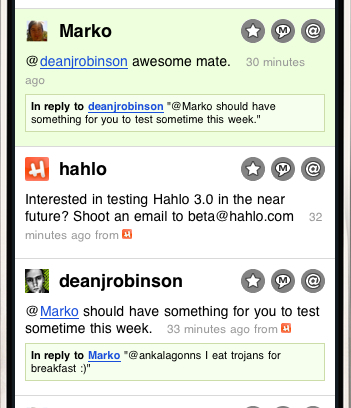 Thanks to everyone who used Hahlo, especially to those who helped with testing (for example, the Hahlo 3 beta had over 1,000 people taking part). 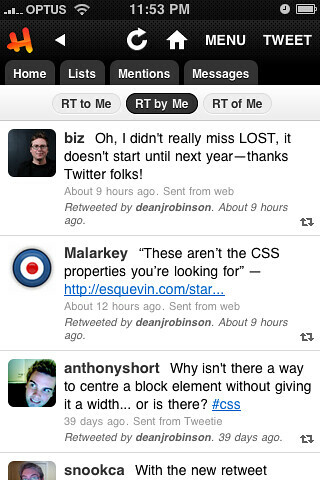 Thanks to those who reviewed it and wrote about it – in 2008 John Gruber described it as his favourite third party Twitter web client. Thanks to those that talked about it on podcasts like TWiT, or recommended it to friends. BIG thanks to those who donated a few dollars here and there – the donations were never going to make me rich nor cover the several hundred hours I spent working on it, but they did help with some initial hosting costs, plus caffeine and sugar to assist with the coding process. Massive thanks, again, to the awesome folk at Media Temple, without them Hahlo might very well have disappeared back in 2008. I’ve noticed a few ‘rogue’ tweets in the last day or two saying things “when Hahlo stops working” etc. Lets clear this up, right now. Hahlo 4.2 (the current, latest, and only supported version) will NOT stop working after Twitter turns off ‘basic authentication’ at the end of June. Not that it iPad friendly wasn’t before, in fact Hahlo ran perfectly fine on the iPad, but with that extra screen space available it would be silly to not make use of it, wouldn’t it? All up it isn’t a massive update, but some good bits and pieces have been thrown in. Early 4.1 mockups with lists! What happens if you can’t use OAuth?